Pin-holes, what they are and how to prevent them. News > Pin-holes, what they are and how to prevent them. 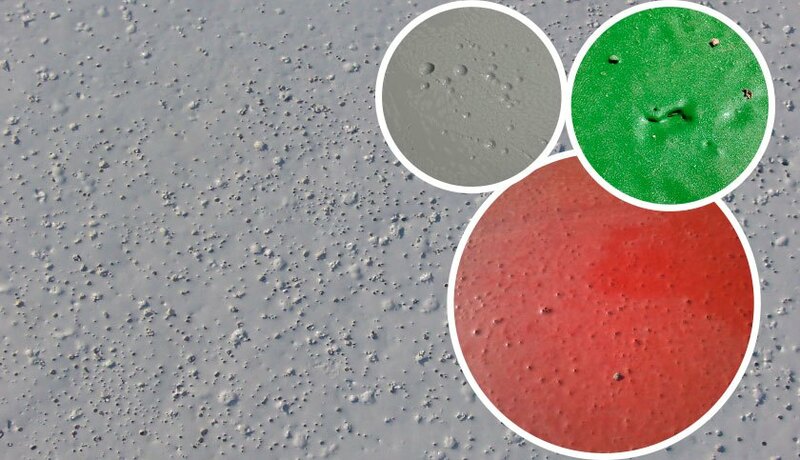 PINHOLES are small craters which form in the applied product during the drying process and which, apart from an aesthetic problem, can also cause functional difficulties, especially in waterproof membranes as they can adversely affect the resistance and efficiency of the coating. When membranes are applied which contain solvents it is important to apply thin coats to prevent the appearance of pin-holes. The reason for this is that solvents are very volatile and tend to rise once the membrane has been applied. With a thin coat this is not a problem; the solvents will evaporate more, but if the coat is very thick, apart from a greater concentration of solvents, they will not have time to escape and will remain trapped inside the membrane forming bubbles in the surface. In some cases these bubbles may actually break through the surface, causing the appearance of pin-holes. In the case of DESMOPOL polyurethane membrane, we can completely eliminate the risk of the appearance of pin-holes or bubbling with the addition of DESMOPLUS. This additive allows the application of DESMOPOL in a single coat with the desired thickness, producing a completely smooth finish with no bubbling or pin-holes. This same problem can occur if the product is foam based or contains air. This is usually due to over energetic stirring of the product. To prevent this we simply need to take the precaution of stirring the product on a slow speed and, if possible, with a basket shaped head. 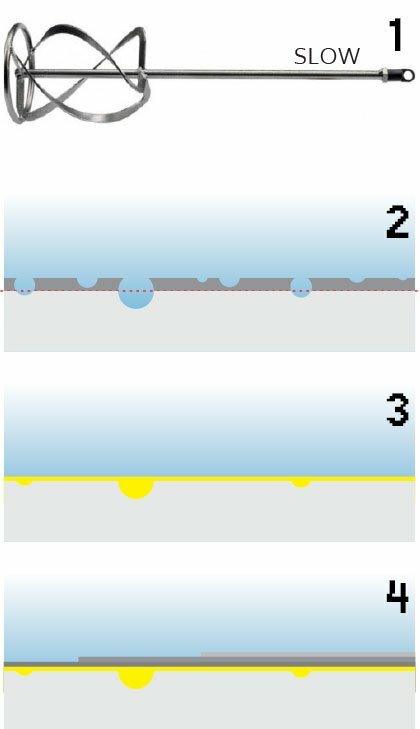 If one applies a polyurea or polyurethane membrane, using spraying equipment, directly onto an untreated or inadequately prepared surface, one is bound to end up with air trapped under the membrane. This air is less dense than the product which contains it, and while the latter is drying, the trapped air rises to the surface and may cause the feared pin-hole effect. 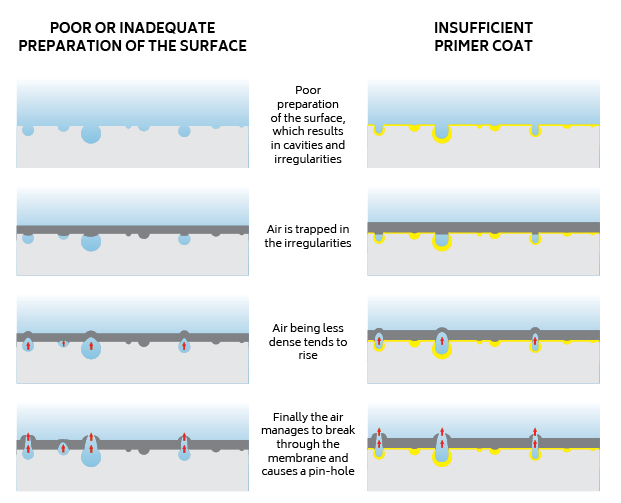 This same phenomenon occurs when a primer is not applied or the coat is too thin or insufficient. 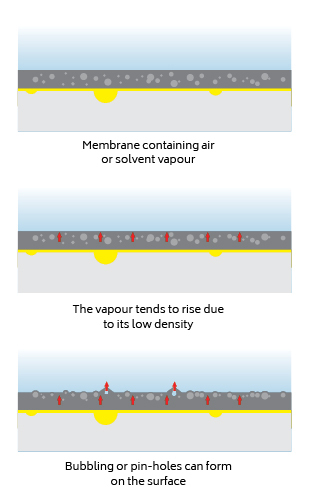 With the application of hot membranes the drying process is much shorter, which might lead us to believe that the air would not have time to escape, however the membrane temperature in fact also warms the air, making it rise faster, also causing the pin-hole effect. Always correctly prepare the surface to leave it as smooth as possible. Ensure there are no cracks, cavities and other irregularities. Correctly prime the entire surface, using one or more coats, to ensure that it is as flat and smooth as possible. When not using the DESMOPLUS additive, which allows application in a single coat, always apply several thin coats.